Eat Carbs and Get a Six Pack? It's Possible | Valet. If you're looking to tone up and shred some belly fat, you've got to do more than simply hit the gym. "Abs are made in the kitchen," is the common refrain from trainers and nutritionists alike because your diet is a far more effective way to lose the layer of midsection fat that's obscuring your six pack. And cutting out carbohydrates should be the cornerstone of your nutrition plan when you're looking to lean up. A Harvard study of more than 60,000 dieters found those who cut back on bread, pasta and starches lost more weight than those who simply cut back on fat and calories. But not all carbs are created equal. The truth is, there are some good, healthy carbohydrates that can serve you well, especially when you're cutting out the junk like white flour and refined sugar in order to lose the spare tire. This old school comfort food is way better than any bread, bagel or bowl of cereal. 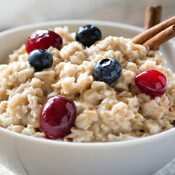 According to Los Angeles-based nutritionist Shira Lenchewski, the oats are full of the good, complex carbohydrates which fill you up and keep you feeling full all morning (making it less likely to go overboard at lunch). Just be sure to avoid brands with added sugars or sweetened add-ins. Instead, Lenchewski suggests stirring in some almond butter, cinnamon or a dash of real maple syrup. Beans are a great source of protein and are also loaded with fiber—both of which are strongly associated with satiety and weight management. 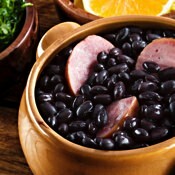 A cup of beans—for example, black beans, pinto beans or chickpeas—boasts approximately 15 grams of protein and 12 to 15 grams of fiber. They're also chockfull of antioxidants and minerals like iron, zinc, calcium and metabolism-boosting magnesium. Keep a couple of these on hand at all times. 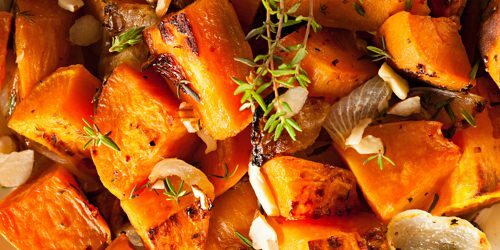 They're easy to bake, roast or saute in a hash and will satisfy a starchy carb craving or a sweet tooth. 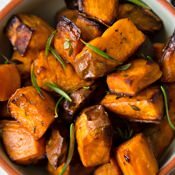 Packed with beta carotene, calcium, potassium, along with vitamins A and C, sweet potatoes are exactly the type of healthy carb you want to be enjoying. One medium baked version has about 24 grams of carbs, but it also has all that important fiber—about six grams in a one-ounce serving. Plus, they've been shown to increase levels of adiponectin, a hormone that regulates blood sugar and keeps your metabolism running at a quick pace. Unlike potato chips or Cheetos, popcorn is a snack you can feel good about grabbing by the handful. 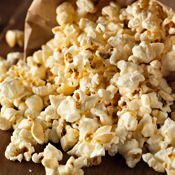 Popcorn is actually a whole grain, and a 2.5-cup serving has just 70 calories, 13 grams of carbohydrates and three grams of fiber. Either air-pop your popcorn or pop it in a plain paper bag in the microwave. Then top it with a small amount of your favorite spice—cinnamon, curry powder, chili powder and Parmesan cheese are all tasty and healthy options. A great swap for rice or pasta, this tiny powerhouse grain contains nearly twice as much filling fiber as other grains. It's also a complete plant-based protein that contains all the essential amino acids your body requires, along with other vital nutrients, including vitamin E, a range of B vitamins and minerals such as iron. 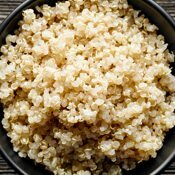 With a mild, nutty flavor quinoa tends to absorb other flavors, which makes it easy to flavor with spices, olive oil and cooking broths. Just because you're trying to cut your carbs and eat healthy doesn't mean you need to live like a monk. Wine is typically lower in cabs by nature—especially compared with beer or ales. Plus, red wine, in moderation, has long been thought of as heart healthy. 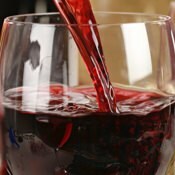 A five-ounce glass of wine has anywhere between zero and four carbs, according to WineFolly.com. So at the end of a meal, if you can't have dessert, a glass of wine won't do you any harm. Common condiments such as ketchup or barbecue sauce are often high in carbs due to their sugar content. Instead, try doctoring up your food with such lower carb condiments as mustard, lemon juice or flavored vinegars. You don't have to starve to get in shape. Stock your kitchen with satisfying foods high in protein and fiber.